On the left you can see the Manchester United team lining up immediately before a game against FC Bayern in 2001, in Munich. What you may not spot straight away is that there are 12 men in this photograph. The man standing at the far left is not a Manchester Utd player. Instead he is a hoaxer called Karl Power, who ran out with the team and joined the photograph. The full story of this hoax is available here. How could he get away with this? Even the players do not seem to have noticed. 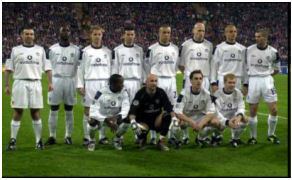 Only Roy Keane (far right) appears to think something is wrong: even Andy Cole, next to Power, seems oblivious. Beyond simply having the chutzpah to do it, the key element of Power’s stunt was the fact he was wearing a Manchester United kit, the same as the rest of the team. Think about what a football kit is actually for. It is to recognise the other members of your team, sure – but there are other ways we recognise people, principally their faces instead of their clothes [*]. But during football matches this is impractical. It would take too much cognitive work in such a fast-paced, high-pressure and dynamic environment as a football match to pass the ball to people whose faces you must first recognise. The kit makes things far easier. Had Power run out wearing a business suit he would have been stopped immediately. But the security guards around the players’ tunnel – and remember, this match did not take place at Old Trafford, Man Utd’s home ground – would have taken a considerable risk had they stopped a real player, dressed in the Man Utd kit, running out at the start of the match simply because they did not recognise his face. (Perhaps he may even have been a little-known reserve player called up to the team – it does happen.) So on he ran. Nor are the photographers going to challenge Power when they are far more interested in getting several good, and potentially valuable, shots of the team before this important game. This is therefore a classic case of misdirection, and of how our cognitive architecture can simply stop us seeing the very obvious. [*] The BBC story does suggest that Power bears some resemblance to former Man Utd star Eric Cantona, which may have contributed to the deception as well; but I find this less likely than the other reasons I suggest. This link – http://viscog.beckman.illinois.edu/flashmovie/15.php – will take you to a film of a basketball game. The point of the film is that you count the number of times the balls are passed between players wearing white. You may have already seen this, of course, but when you watch it for the first time, try to perform this count, and do so before coming back and reading the next paragraph. If, on your return, you have failed to see the point of doing this, well, you are right – that was not the point. So go back and watch it again without concentrating on the balls. Even more so than example 1, this is a classic illustration of misdirection – more specifically, the phenomenon of cognitive load. We can only concentrate on so much at one time and are quite capable of missing very obvious things if we are not specifically looking for them. All researchers need to be aware of this. You may think these relatively trivial and non-academic examples are interesting, but not relevant to research, because that activity takes place over a longer period and is more involved. On the contrary: these illustrate key aspects of how we filter the sensory information all around us, so ultimately, cannot help but also affect our absorption of textual and other educational information as well. As said in the audio file, many of the processes and structures of good research are designed precisely so that subjective, cognitive biases can be overcome with reference to other forms of valuing information, the objective level of scientific method and accuracy, and the intersubjective validation of that information through engagement with colleagues by publication, conferences, seminars and informal conversations. The place to start, however, must always be with an awareness of how our own minds can easily trick us. For dozens – literally – of other cognitive biases, see the resource at http://www.scribd.com/doc/30548590/Cognitive-Biases-A-Visual-Study-Guide. Hi, this is just one of the WP standard themes, INove is its name.